Flip Out Mama: Healthy Smiles with Reach And Rembrandt! I don't know about your house, but here, toothbrushing (okay, any hygiene in general) is NOT on my boys' list of favorite things to do! I am always looking for something, anything, to pep them up a little, to make these dreaded tasks just a little more fun! Recently, we got to review a giant package from Reach and Rembrandt featuring some great oral health products for the whole family! We were all really excited to get some new cool stuff around here to make tooth brushing a little more inticing! 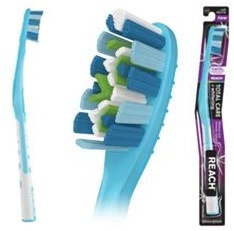 First, I want to tell you guys about the Reach Total Care + Whitening Toothbrush. REACH® Total Care + Whitening is a new product line providing the ultimate, multi-benefit oral care . Formulated with new CaCO3 MICRAWHITENING™ technology, REACH® Total Care + Whitening toothbrushes and floss are purposefully designed for superior plaque removal and whitening. Total Care + Whitening is the ultimate addition to your whitening and oral care routine. Next I want to take a minute to tell you about the Reach By Design Collection. These are my favorite! The new REACH® by Design™ collection adds a splash of style to your brushing routine while also offering the uncompromising cleaning performance you’ve come to expect from REACH®. Finally, your toothbrush can be functional AND fashionable! Aren't they cute!? We received a two pack of these, one for dad and one for me! They are awesome! 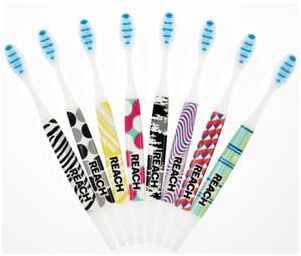 I really like how Reach has taken something as boring as a regular old toothbrush and jazzed it up like this! These brushes have the multi level bristles, so they are good at cleaning in between teeth and behind back teeth. And all the designs are limited edition, which makes collecting them fun and exciting every time you need a new brush! Love it! 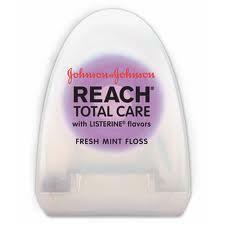 The next product we got to try was Reach Total Care plus Whitening Floss. Tater was exceptionally excited that they make floss that is purple. (He lives a deprived life, I know!) This made him much more excited to floss than usual. He hates flossing and it is usually a big fight to get it done! This floss is designed not to shred, which is a definite plus. It is also designed to get up to twice as much plaque as regular floss. Which means, less time flossing! #Win! 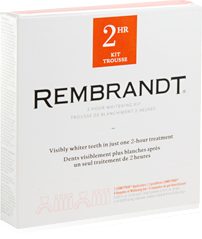 Next, Dad and I got to try some Rembrandt Whitening products. We have looked at these before but never had the extra money to spend on them, so we were super excited to get to review them! Dad got to review the Two Hour Whitening Kit. He was really impressed with the results! This kit comes with dentist like trays to make the experience just like a professional one! Dad wasn't fond of the taste, but we can really tell a difference after using this kit! 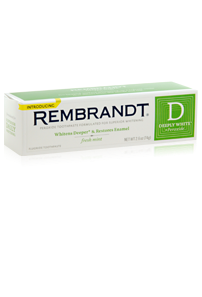 We were also lucky enough to get to review Rembrandt Deeply White toothpaste. I have been seeing commercials for this the last couple weeks and have been really excited about trying it! The taste is really good! I was a little nervous since it is a whitening toothpaste and all, but I was pleasantly surprised! The peroxide makes kind of a bubbly feeling in your mouth, like you can feel it getting your teeth cleaner! I really liked it! We really enjoyed trying all these Reach and Rembrandt products! I think we will all be a little more motivated to brush and floss with all our cool new goodies! disclosure: we received a sample product in order to conduct this review. Although a sample product was received, all opinions are my own, and I received no monetary compensation.